Offering the efficient and reliable GeoComfort brand to our customers. What can you expect from a GeoComfort system? In addition to the highest heating capacities, GeoComfort also boasts the best heating efficiencies. 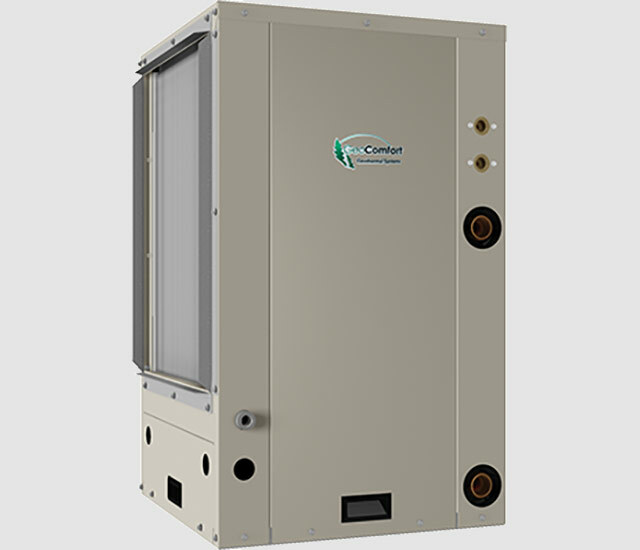 With an average of 4.62 across the product line, and a staggering 4.8 COP (Compass Series XT036) that has raised the bar within the geothermal heat pump industry. How much can I really save by installing a geothermal system? While your exact savings will be determined by many variables, including your climate, thermostat setting and electric rate, most homeowners will see a reduction of 30 to 70 percent in their heating and cooling costs. A study by the U.S. Environmental Protection Agency showed that geothermal systems have the lowest life-cycle cost of all heating and cooling systems currently on the market. Lower maintenance costs and longer life expectancy of geothermal units should certainly be taken into consideration when determining true savings. Contact Esser’s for details on how much you could save. Is geothermal heating and cooling technology new? Actually, the basic “modern” technology has been around for more than 50 years and improved upon ever since. To date, over one million installations in the United States alone have allowed a significant amount of homeowners and businesses to enjoy the benefits of geothermal systems. In fact, consumers rank their comfort and satisfaction with geothermal systems higher than any other type of system. What is the real environmental impact? According to data supplied by the U.S. Department of Energy (DOE) Office of Geothermal Technologies, nearly 40% of all U.S. emissions of carbon dioxide (CO2) are the result of using energy to heat, cool and provide hot water for buildings. This is about the same amount of CO2 contributed by the transportation sector. Versus a conventional fossil fuel system, a standard 3-ton residential geothermal system produces approximately one less pound of carbon dioxide (CO2) for every hour of use. Over twenty years, the carbon footprint reduction would be equivalent to planting 120,000 acres of trees or converting over 58,000 cars to zero emission vehicles. By taking advantage of the “hot water assist” option, you can lower emissions even further by allocating heat removed from the home during the cooling season to provide hot water for household consumption. In addition to the environmental benefit, hot water costs can be reduced by as much as 30%. Safe: Flammable fossil fuels are not used to operate geothermal units. Because there is no combustion, there is no chance of explosion, hazardous fumes or risk of carbon monoxide poisoning. Lower Operational Costs: Geothermal systems have efficiency ratings of 400 to 500 percent. An efficiency rating is the ratio of heat actually generated versus the amount of energy used to produce the heat. A rating of less than 100 percent means you are losing heat that you are paying for. This loss is typically caused by energy consumption required for the combustion process of a fossil fuel furnace. The most efficient natural gas furnaces cannot compete at a rating of only 95 percent. Green: Geothermal systems have a positive impact on the environment since they burn no fossil fuels and operate on a modest amount of electricity. According to the United States Department of Energy and the Environmental Protection Agency, geothermal systems are the most environmentally friendly way to heat and cool your home. They do not emit greenhouse gasses, which are known to contribute to environmental air pollution. Peacefully Quiet: Conventional air conditioners and heat pumps require noisy outdoor equipment. Geothermal systems do not. In fact, GeoComfort Compass SeriesTM units feature a patent-pending cabinet design that isolates the units compressor, all but eliminating any rattling or vibration caused by system operation. Flexibility: A geothermal installation is an excellent heating and cooling solution for nearly any situation. Geothermal systems perform well in cool northern climates as well as warm southern conditions, in homes small, large, new, existing and every home in between.